The last decade of global conflict has seen the dawning of the age of the robot plane. Unmanned Aerial Vehicles (UAVs) have been around for decades, but today they're ubiquitous war machines with unmatched endurance and lethal combat capabilities. Find out more about these increasingly high-tech pilotless aircraft. Drones were developed in the early days of aviation, and were used almost exclusively as moving targets for training exercises. Serious development of controllable unmanned aircraft in the 1960s lead to extensive use in Vietnam. The AQM-34 Ryan Firebee, for example, flew over 34,000 missions – primarily used for surveillance, they could also detect enemy anti-aircraft missile installations. Once launched, they were controlled remotely by a "pilot" in a DC-130 flying nearby. The Lockheed D-21 UAV, which looks like one of the engines from the Lockheed SR-71 Blackbird detached and given autonomy, holds the record as the fastest UAV, topping Mach 4. However, it never made it beyond the testing phase (photo: a D-21 piggybacks on top of an SR-71). The military UAVs familiar today trace their lineage to aircraft developed in the 1980s. Israel was at the forefront of UAV design, using several light, remotely controlled aircraft to great success in the 1982 Lebanon War. The first modern UAVs used by the U.S. military were Israeli Pioneers purchased in the early 90s. Better remote control and camera technology allowed UAVs to take on more involved reconnaissance roles. The Israeli light UAVs also focused on light, efficient designs, emphasizing one of the UAV's most important abilities – incredible in-air endurance. Today's UAVs can remain on-mission for 30 to 40 hours, far beyond the capabilities of any human crew. Research into mid-air refueling of UAVs and ultra-efficient solar-powered UAVs could extend that range close to infinity, limited primarily by maintenance needs. The most well-known U.S. UAV is the Predator, designed and built by General Atomics Aeronautical. The Predator is typical of UAVS in that is uses a relatively simple design that allows simple field maintenance and high reliability. For instance, the 4-cylinder turbocharged engine that powers a Predator is similar to those used in snowmobiles, and the alternator that provides most electrical power would be familiar to the average garage mechanic. One notable characteristic of current generation UAVs is the "cockpit" bulge, a featureless dome where the pilot would sit in a conventional aircraft. This dome houses an array of antennas that allow control and sensory signals to move back and forth between the plane and the controller. The largest is a satellite communications dish – this dish's size and placement are the main reasons UAVs are shaped as they are. The U.S. military was not content to merely identify targets with their UAVs – they wanted to blow them up, too. That's why the Predator (and its variants the Gray Eagle and the Avenger) can be armed with Hellfire missiles. In this configuration, they are not used as front line warfighting machines – against a plane with a human pilot, a UAV will lose every time. They're more like high-tech assassination weapons. In that capacity, the U.S. has used them to kill high-level al-Qaeda operatives like Anwar al-Awlaki. The drawback of this approach is that the imprecision of the Hellfire has caused numerous civilian casualties (the exact number is perpetually in dispute). In the future, UAVs may be armed with smaller, more precise armaments such as the Griffin or Spike missiles. You might expect that future UAV development points toward fully autonomous planes. There is certainly work being done in this area. Today's UAVs have some forms of autonomy – flight control surfaces may be fully automated, with the controller simply issuing a series of GPS waypoints as the on-board computer handles the details. It's important to note that UAV autonomy research comes mainly from the control angle. That is, programs are written with sensor input/decision trees for the plane to follow. Actual artificial intelligence is not a major aspect of UAV research. But overall, autonomy is not a priority right now. It's a cost-benefit issue – the cost of developing effective autonomous UAVs is undercut by the cost of training human controllers, and there's no great necessity for planes that fly themselves. The political and social ramifications of fully autonomous planes armed with missiles also loom large within the Pentagon. If not toward autonomy, where is UAV development heading? Toward robustness and ubiquity. Next-generation UAVs will be larger, allowing them to carry more payload. They will also have more powerful engines – the Avenger variant of the Predator has jet engines – allowing for faster response time. Proliferation of the technology means non-NATO countries will have their own UAVs. Russia has a relatively successful UAV development program, and manufacturers are selling designs like the Hermes 900 to South American countries. Pilotless aircraft will soon be part of a every belligerent international conflict. That ubiquity can be worrisome, though, when it takes place back home. For now, UAVs used in domestic situations in the U.S. have been smaller, "man-portable" units used for search and rescue, fire suppression and surveillance. 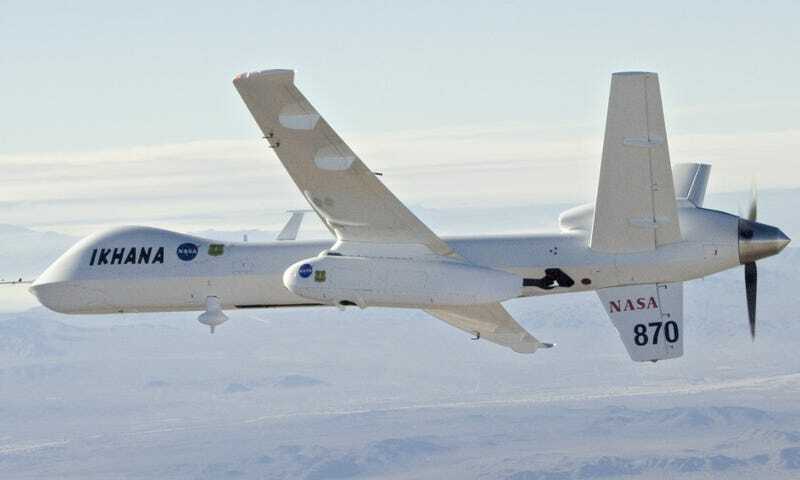 NASA uses a Predator variant called the Ikhana (top photo) for civilian research and development. What happens when the cost comes down and every police department in the country has a fleet of UAVs constantly in the air? Current privacy laws are probably not going to answer all the questions such a situation will bring up. The counterpoint to this UAV-powered panopticon is that it is becoming increasingly easy for the average citizen to create and operate a UAV. The website DIYDrones offers access to an open source project called ArduPilot. ArduPilot is a computer that installs into a plane (typically a radio-controlled plane), then runs the ArduPlane autopilot software, transforming it into a UAV. Civilians even created a UAV to observe police activities during Occupy protests – the OccuCopter is a quad-rotor UAV that can be controlled via iPhone and streams video live to the internet. A future filled with UAVs will be a mixed bag. In wars, fewer pilots will die, but civilian casualties might increase. Pervasive government surveillance will test Constitutional law and give rise to new technologies that counteract it. At least a vast fleet of autonomous combat aircraft susceptible to control by a sentient computer network is one problem that seems to be a few decades away. Global Atomics. "Predator C Avenger." Hambling, David. "Efforts Are Underway to Arm Small UAVs." Aviation Week. Putrich, Gayle. "AUVSI: Raytheon designing UAV-specific weapons." Flightglobal. Sharkey, Noel and Knucky, Sarah. "OWS Fights Back Against Police Surveillance by Launching "Occucopter" Citizen Drone." Alternet. Space Daily. "Elbit Systems Awarded Contract to Supply Hermes 900." Valdes, Robert. "How the Predator UAV Works." HowStuffWorks. Photos: NASA, U.S. Department of Defense, CIA.